We offer a very big range of facial/ massage bed, which is directlyimported to the mother land China. 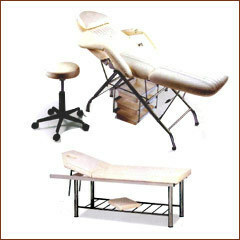 The flexible armrests lay flat withthe bed so that the esthetician can work comfortably. Our esteemed customers can avail from us the best 3 Fold Facial Massage Bed at an economical price. Designed to perfection, these beds are provided with adjustable head and arm rest. Salon facial beds available in various sizes. These are fabricated from quality raw materials and marin plywood with pasted venier that are procured from the certified vendors of the wood industry, Further, these are highly appreciated for its abrasion & corrosion resistance, high load bearing capacity and longer service life. Aavailable in dark brown finish. With our expertise and trustworthiness, we are engaged in offering an optimum quality range of Adjustable Facial Bed. We have carved a niche amongst the most trusted names in this business, engaged in offering a comprehensive range of Salon Facial Bed. Banking on the individual requirements of the clients, we offer wide array of Facial Bed that are quality approved and ensures perfect place for the body massage and not only relaxes body but also mind and soul. We offer them with comfortable bedding to ensure natural appearance. Facial Bed helps to comfortable massage for the face. 3 fold facial bed for salon purpose...available in all color....1 year gurantee...product is available in all size and designs....customised beds also available.